If it’s true that something done with love is done par excellence, then the work of Maria Pergay, the French artist-designer who made stainless steel chic in the late 1960’s, shines in the most wonderful way. From her early days as a self-taught silversmith crafting exquisite, one-off decorative objects, Pergay seems only to have followed her heart, and never the market, when it came to her designs. 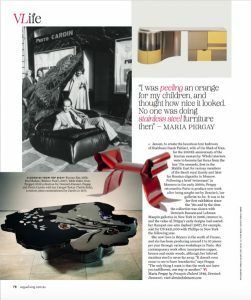 Many did not become fashionable until years after they were created, but, that’s not to say she did not attract a cultivated following of devotees along the way: her first collection of furniture, for example, exhibited at Galerie Maison et Jardin in Paris in 1968, was bought lock, stock and barrel by couturier, Pierre Cardin. “You can’t really categorise her,” explains Suzanne Demisch of Demisch Danant, Pergay’s New York gallerist. “That’s what has always made her so interesting.” Born in 1930 to Russian Jewish parents in Chisinau, in what was then Romania, Pergay and her mother fled to Paris in 1937 to escape an expected Soviet invasion, only to then have to go into hiding when the Nazis occupied the city in 1940. After the war she studied costume and set design at the Institut des Hautes Etudes Cinématograhiques, also attending sculpture classes with Russian-French artist Ossip Zadkine in Montparanesse. In 1954 she began helping a decorator friend dress shop windows in Paris, one of which was next to Hermès. Her theatrical approach garnered much attention and within a few years, she was crafting small decorative objects, such as her trademark ribbon and belt-buckle adorned silver boxes for Hermès as well as Christian Dior, Jacques Heim and Givenchy. She made a silver rooster vase for Pierre Cardin and a gold butterfly set with semiprecious stones for Salvador Dalí, and spurred by the interest in her work, opened a shop on the Place de Vosges in 1960. Other exhibitions, both in France and abroad, were to follow. Maison Jansen, for whom Pergay had created the master baths of the Tunisian presidential palace in 1960, began to sell her stainless steel furniture in their Paris showroom in 1969. And in 1970 she was commissioned, again by Jansen to create the luxurious tent bedroom of Shahbanu Farah Pahlavi, wife of the Shah of Iran, for the 2,500th anniversary of the Iranian monarchy. Whole interiors were to become her focus from the late 70’s onwards, first in the Middle East for various members of the Saudi royal family and later for Russian oligarchs in Moscow. Following a brief ‘retirement’ in Morocco in the early 2000’s, Pergay returned to Paris to produce new work after being sought out by Demisch, her gallerist-to-be. 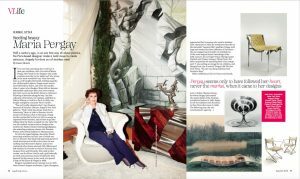 It was to be her first exhibition since the 1970’s and by the time the collection was shown with Demisch Danant and Lehman Maupin galleries in New York in 2006, interest in, and the value of, Pergay’s early designs had soared: her Banquet daybed (1967), for example, sold for USD421,000 with Phillips in New York the following year.